This unique rolling planter and trellis duo can be used indoors and outdoors. Your plants will always have the water they need even if you are away, as the planter features a built-in 2-1/2 gallon reservoir and water level indicator with convenient easy-fill filling tube. To move, unlock the castors and push the planter to the desired spot. Covered with flowers or vines it makes a convenient privacy screen. Made of UV-resistant polyethylene. Ships in two boxes. Base planter 8-pound. 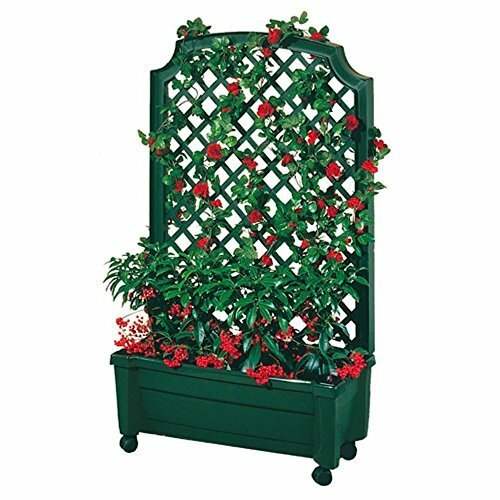 12-Inch h by 31-inch w by 13-1/2-inch d trellis 12-pound. 45-Inch h by 31-inch w by 3-inch d. Color: green.